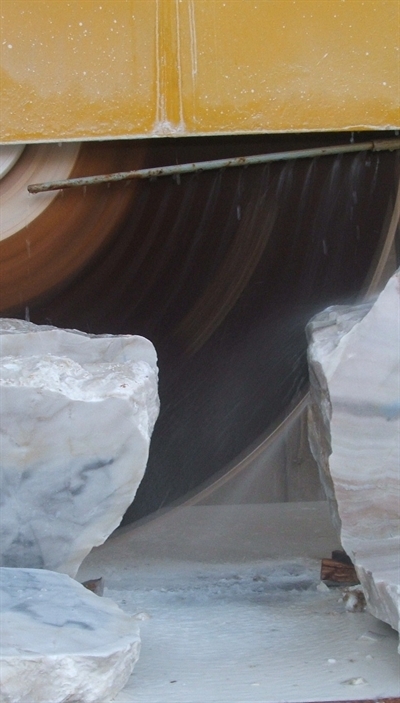 Alabaster is extracted from ancient deposits. The extraction areas are evaluated by logging and depth calculations. Alabaster is found at depths varying from 3 to 200 metres, and, depending on the chemical composition of the soil, can be any of a number of different colours. 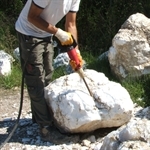 Alabaster is found in irregular blocks distributed randomly within chalk strata. Until recently, extraction was still carried out by hand, with scalpel and axe, but today small mechanical excavators are used extensively. 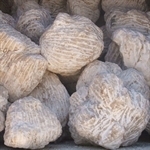 The blocks are surrounded by a rigid covering of clay and a mass of crystallised gypsum, called "panchino". They are cleaned and ‘combed' with pneumatic hammers – processes that take considerable expertise and experience. The outer covering is discarded, leaving nothing but the core of the alabaster. 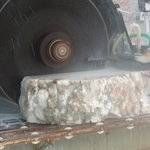 The blocks are then cleaned and taken to our sawmill, where they are cut to varying thicknesses using a diamond-disc milling cutter to produce unfinished slabs. On request, we can produce parallelepiped slabs for artisans who produce spherical objects on lathes.